No.NU/EsttJG-27/2010 Dated: Lumami the 28th Feb’2014. 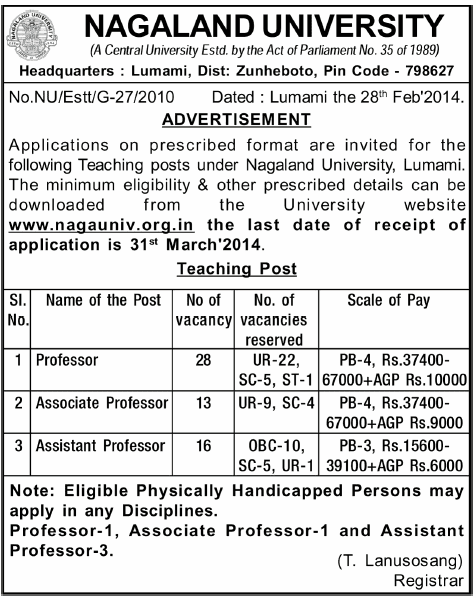 Applications on prescribed format are invited for the following Teaching posts under Nagaland University, Lumami. The minimum eligibility & other prescribed details can be downloaded from the University website www.nagauniv.org.in the last date of receipt of application is 3ISt March’20I4. Note: Eligible Physically Handicapped Persons may apply in any Disciplines. Professor-I, Associate Professor-I and Assistant Prof essor-3.